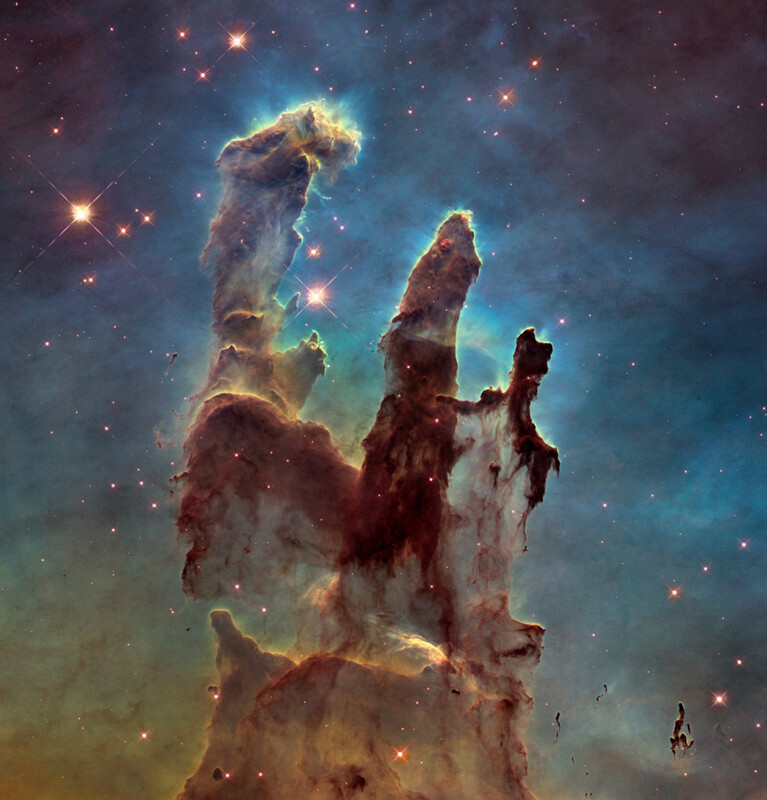 What happens with this relentless and unimaginative hypersuperlativation of language is that when we look at an image like the one above, the Pillars of Creation in the Eagle Nebula M16 (taken this week by the Hubble Space Telescope’s new hi-res camera), we are at a loss for words. “Awesome” is already dialed to 10 and we have nowhere else to go. Let me give you some perspective. See that left hand cloud in the picture above? It’s approximately 4 light years long. That’s the same distance out to Alpha Centauri, our nearest star. In the hi-res version of this image (which I highly recommend you download) our entire solar system, five billion miles wide, would fit into a single pixel, comfortably. This nebula is 6,500 light years away, which means we’re looking at something as it existed in 4,500 BCE, before Stonehenge, before the Pyramids, 1,200 years before the first writing. Because it took light that long to reach us. And you know what else? This truly awesome nebula doesn’t exist any more. Astronomers calculate that this entire, incomprehensively gigantic structure will have been blown away by a supernova about 5,500 years ago. We just won’t see it for another 1,000 years. Now don’t you feel puny? But wait, there’s more: As awesomely awesome as the Pillars are, when compared to our Milky Way galaxy in which it used to exist (diameter 100,000 LY) the entire nebula wouldn’t even be a pixel on an image of that. And the Milky Way is itself half the size of the Andromeda galaxy (M31) which is heading right for us. Might want to hang on to something in 3.25 billion years or so when the two collide. I could go on, but then I’d have to invoke the Monty Python Galaxy Song. I have a personal, nostalgic stake in this, though. 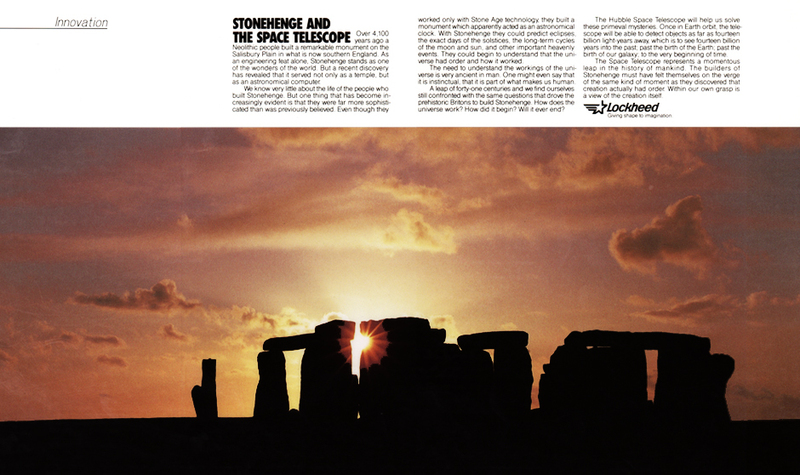 Twenty-six years ago I did an advocacy ad for Lockheed (see below) urging Congress to keep funding the Hubble, which hadn’t been launched yet. Congress did. I like to think it was thanks to the awesome power of my persuasiveness. And Hubble went into orbit the following year. But just weeks before it went up, I got to go up to Sunnyvale in the Bay Area to actually see it in person. And looking down on that thermos-shaped school bus from the visitors’ gallery, a thrill went up my spine. We were about to see things we had never seen, at scales we couldn’t even comprehend. The advocacy ad I did for Lockheed to persuade Congress to keep funding the Hubble Space Telescope. About the cloud shape that is 4 light years long, which I calculate that it will take “forever” for it’s light to get here, I’m not waiting. And, John, if you were try and cover that distance at the speed of plate techtonics (also likened to the speed at which fingernails grow), it would take…well, a lot longer. Hold on. I’m calculating: 1.71 billion trillion years. Might want to bring a book.